For the past decade or so, horse and carriage rides have been available in Boston. Carriage rides are a unique and romantic way to tour downtown Boston. The main carriage stand in Boston is located at Chatham Street near Faneuil Hall Marketplace. The rides generally operate during weekdays in the evening, 6:00 pm to Midnight, and on weekends from 12:00 pm to Midnight (seasonal). There are three to four private companies that operate the horse and buggy tours. Visitors can walk to the carriage stand at Chatham Street, or make reservations in advance. Reservations are generally only allowed when a ONE HOUR TOUR or longer is booked. The routes are fixed in downtown Boston, and diverting from a planned route requires a 48-hour notice to the police department per hackney regulations. Tours usually are offered at durations of 15-20 minutes, 30 minutes, or one hour. The rates, subject to change by vendor, are about $40-$45 for the 15 minute tour, $70-$75 for the 30 minute tour, and $150+ for one hour. A 20% gratuity is expected unless service is sub-par. Extended tours are available via advanced reservation at $150+/hour. 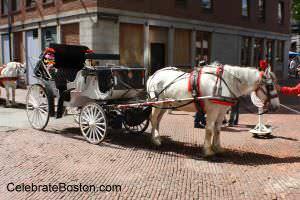 The normal buggy routes are Faneuil Hall Marketplace to Post Office Square and back for the 15-20 minute tour. This area is known as the Financial District, with the carriage usually passing the Custom House Tower and the old Boston Federal Reserve Building. Post Office Square is very pretty in summer, with a small park in its center that has an atrium-style walkway and fountain. The 30 minute tour normally travels up Devonshire Street past the Old State House and down to Post Office Square from there (possibly returning via Atlantic Avenue). The one hour buggy tour travels to the more distant Boston Common and Public Garden. ALWAYS check with the carriage operator for current routes of the tours. Some people like to book carriage rides for special events, such as weddings and proms. In the early Spring, when the trees are budding, and in the Fall, when the leaves have color, it is a pretty time of year for romantic events. Post Office Square has several trees that change color in autumn. If the one-hour tour travels down Charles Street Extension between the Common and Public Garden, the leaves are beautiful in Fall at the gardens, especially the weeping willows. The horses are accustomed to people and vehicular traffic, and very friendly. Children often walk up and pet a the horses at the main hackney stop at Chatham Street.